We meet second Wednesdays, 6 p.m., GenMixer social hour, and 7 p.m., program, at The Venue, Library 21c, 1175 Chapel Hills Dr., Colorado Springs, CO. Plenty of free parking in two lots. Guests are welcome. The PPGS board meets the first Wednesday of the month, 5:30 p.m., at East Library. No meetings in July and December. 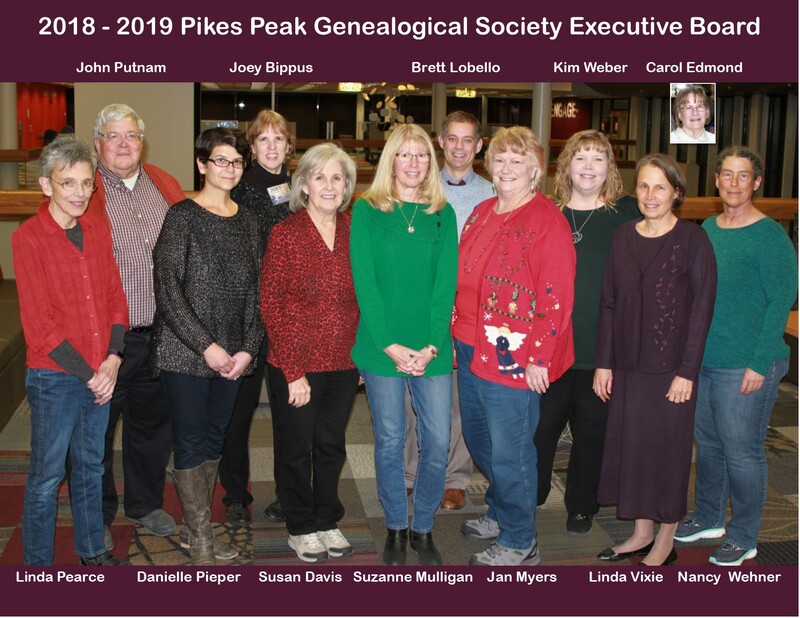 The Pikes Peak Genealogical Society (PPGS), a 501(c)3 nonprofit organization, was founded in 1980 with 140 charter members. The society is administered by an executive board of elected officers and volunteers who serve two-year terms. Volunteers extract data from newspapers and other key local resources to provide valuable genealogical indexes and databases in Special Collections and on the library’s website. The Book Committee selects and purchases books for the Special Collections. In cooperation with Special Collections, the Education Committee increases the public’s knowledge of genealogy by presenting programs to individuals and groups in the local community. GenMentors offer free genealogical consultations upon request. It's recommended that genealogists get the basics of genealogy by attending the series of free workshops offered three times per year. PPGS is a member of the Colorado Council of Genealogical Societies and the Federation of Genealogical Societies.